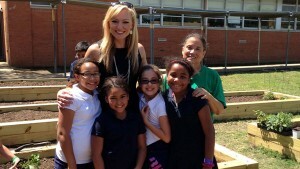 WFAA.com- May 1, 2013 – “Catherine Southwick from Arthur Kramer Elementary in Dallas has been inspiring her students to be more environmentally aware, which has made the students more conscious of their actions and their effects on the environment. Do you want to support Green Ribbon Schools and Healthivores, while helping Austin reach the goal of raising $1 Million in 24 hours for over 330 non-profits? Become an INDIVIDUAL FUNDRAISER for Cyberways and Waterways (the non-profit that brings you the GRS and Healthivores programs) during the Amplify Austin Event. Sign up to have your very own fundraising page, set your own fundraising goal, and spread the word to friends and family. As an added bonus, once we reach 30 donors during that 24 hours period, Cyberways and Waterways will qualify for a portion of the $100,000 that University Federal Credit Union has donated to Amplify Austin. So your donation goes even further. Today’s children are the first generation in two centuries facing a shorter life expectancy than their parents. This shortened life span stems from poor physical and mental health and education deficiencies. Cyberways and Waterways develops programs that make learning and taking action around personal health, sustainability and STEM subjects fun for children, so we can reverse this alarming trend. As you know, the Green Ribbon Schools and Healthivores programs are FREE to any K-12 private or public school. Currently we have 90+ schools participating in Austin and close to 800 nationwide. We want to make sure we can keep the program free as we grow, and this is a great opportunity for you to help assure that we can. “Receiving the 2012 Energy Star certification means the district performs in the top 25 percent of organizations/businesses with similar facilities nationwide and that Schuylerville meets strict energy efficiency levels set by the EPA. Energy Star certified buildings typically use 35 percent less energy than average buildings and release 35 percent less carbon dioxide into the atmosphere. Riggi also credits Schuylerville’s Green Ribbon School Team for helping the district earn this designation. “Members of the Green Ribbon School have provided many additional energy-saving ideas and have made the campus a much more environmentally friendly place to be,” he commented. 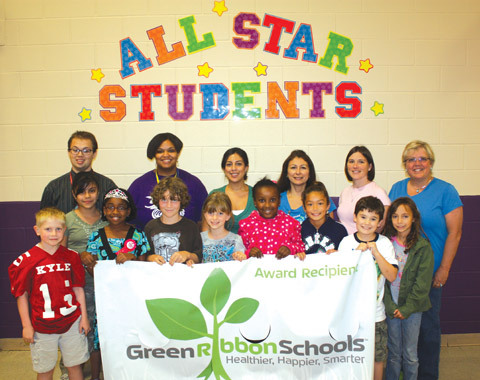 Houston ISD News Blog – October 26, 2012 – Berry Elementary School received a “Green Ribbon Schools” Award recently from a national program of the same name in recognition of its leadership in touting green initiatives on campus. The school was one of only 63 campuses chosen from among 13 states and Guam to win the award, and Berry was selected for achieving the online community’s highest level of participation during the 2011–2012 school year. Water Police—Designed to reduce the use of plastic water bottles on campus through an information campaign. Students patrolled the campus looking for people carrying plastic water bottles and issued citations containing facts about why plastic bottles are a poor use of a nonrenewable resource and suggestions for better container choices. Students tracked and recorded their data to see if their efforts were making a difference, and in just eight weeks reduced the number of citations issued by 75 percent. Bird Strikes Investigation—Concerned about the number of birds that were hurt or stunned flying into the school’s windows, first grade students charted data to track where this phenomenon was happening the most on campus and moved to prevent additional strikes through the strategic application of window decals and the installation of bird houses affixed with suction cups. 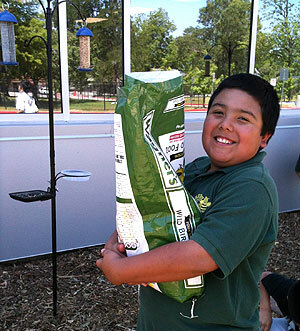 Students continue to monitor the decals and bird houses to determine their effectiveness in preventing bird strikes. Healthy Snacks for All—This project was sponsored by the Berry ES Parent Teacher Organization, who arranged for healthy snacks such as apples, pears, and oranges to be given to students twice a week just before dismissal. The campaign has shown that students respond positively to healthier options, as evidenced by fewer candy wrappers and soda bottles in trashcans and recycle bins. Since the majority of Berry students are considered to be economically disadvantaged, this is the first time students are regularly eating fresh fruit as snacks. As a result of this exposure to different types of foods, students are now requesting more fruit with their breakfasts and reaching for the fruit plates offered during lunch in the cafeteria. “I am very proud of my teachers for integrating authentic, meaningful, problem-solving activities into everyday learning,” said Principal Deborah Silber. “And I am proud of our families for embracing environmental advocacy. 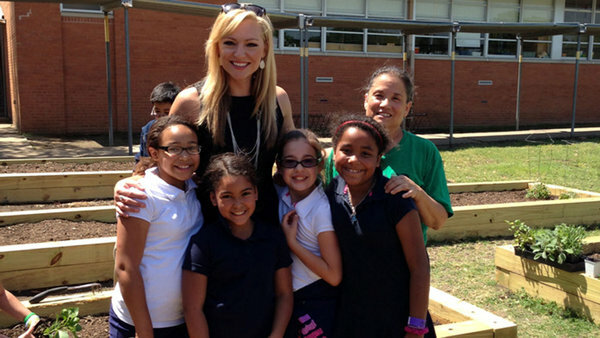 That is so important for the future of our students.” Green Ribbon Schools is challenging the 648 elementary, middle, and high schools in its 40-state community to create a “Greenprint” for 2012–2013 and become even greater success stories. The national “Green Ribbon Schools” recognition and award program is collaboration among organizations committed to helping children develop their full potential by connecting with the wonders of nature. Sponsors include the AMD Foundation, the Brown Foundation, Blue Cross/Blue Shield of Texas and individual contributors. The program includes the Healthivores® contest to promote healthier lifestyles. Butcher came to the campus just over a year ago following a stint as Assistant Principal at Negley Elementary. She quickly shared her zeal for things environmental and that enthusiasm naturally dovetailed with the portion of Hays CISD’s 5-year strategic plan that addresses conservation. Strategy 6 in the plan says, “We will infuse instruction with environmental stewardship and integrate sound environmental practices into facility design, constriction, and operation.” That charge is increasingly prioritized in the district and Fuentes Elementary is one of the most visibly and demonstrably committed sites in the district. The recognized activities must fall under the award’s “Four Cornerstones,” those areas including Eco-Campus, Health and Fitness, Nature Adventure and Natural Classrooms. The seven-member “Fuentes Green Team” of Butcher, librarian Alma Medina, and teachers Kris Brown, Karee Bursiel, Kelsey Haltermann, Candace Robertson and Jayme Salinas oversee the ongoing efforts to touch each of those areas.